Devastating tornado in Oklahoma begs the question: Why don't schools and families build tornado shelters anymore? (NaturalNews) A mile-wide tornado with 200mph winds tore through the suburbs of Oklahoma yesterday, killing 51 people and broadcasting a rude reminder of the fragility of human life and human civilization. 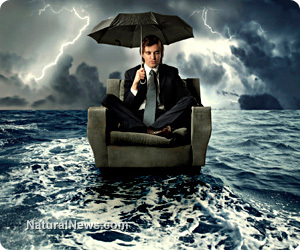 Here at Natural News, our hearts go out to the family members of those killed in the storm, and we hope some lessons can be learned from this that will save other lives in the future. But wait a second, you can't stop a tornado, right? Of course you cant. But you can prepare for a tornado, and here's where we get into a discussion that the mainstream media won't dare touch because it's not "politically correct" to have an intelligent discussion about any of this. But here's the question we need to ask if we're going to save lives: How many of those who were killed in the tornado knew there was a tornado warning in place but did nothing to move to a safe shelter? Obviously this question doesn't apply to all the children who were killed, as they are not responsible for their own actions. (Their parents are.) But how many adults actually took the tornado warnings seriously and sought adequate shelter? Because here's the simple, raw, undeniable truth of the matter: People who seek shelter vastly reduce their chances of becoming fatalities during any disaster. Tornados and hurricanes, in particular, come with advance warnings. They aren't like earthquakes that suddenly appear without any warning at all. Tornados usually give you minutes or even hours of advance notice. Hurricanes give you days of advance notice. And yet, even when huge hurricanes are approaching their target, many people deny the danger and take no precautions at all! To be clear what I'm saying here, you can never control 100% of your risk or outcomes in a natural disaster, but through smart preparedness strategies, you can very often control 80% or more. Taking tornados as an example, there is a reason why Oklahomans have, for generations, built "storm shelters" where they could retreat to survive an approaching storm. The photo on the right, for example, shows a low-tech, high-survivability storm shelter that can easily be installed in almost any yard. Storm shelters offer almost 100% survivability against tornados. Tornados cannot penetrate underground, after all. If YOU are underground, even in a small, cramped storm shelter that's just two meters wide and two meters tall, you have an almost 100% chance of emerging from the storm completely unhurt. Most fatalities in tornados happen because people are killed from flying debris. You might even call it "wind shrapnel." Take a bunch of lumber, aluminum siding, bricks and roof trusses and accelerate them to 200 mph and you have a deadly weapon that will kill almost anyone it touches. But put your body just three feet underground -- in a tornado shelter -- and all that debris flies right past you, harmlessly above your shelter. 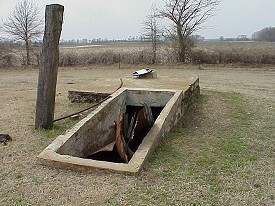 Investing in a storm shelter, however, requires forethought. It requires long-term planning, and the culture of America has radically shifted away from long-term planning to short-term thinking. This is evident in our national debt spending, national politics, consumer behavior, education system and everything else. Housing companies that build homes in Oklahoma, Kansas, Northern Texas and other "tornado alley" zones don't even offer storm shelters. Most home buyers don't want storm shelters because they aren't long-term thinkers. But consider the facts: If you live in Oklahoma, you have to realize the area is going to be struck by devastating tornados sooner or later. People who live in Los Angeles have to be aware they're living in an earthquake zone, and folks who have homes in Florida must certainly realize they are sooner or later going to get hit with category 5 hurricanes. This isn't rocket science. No one who lives in Kansas, Oklahoma or Texas can claim to have been "caught by surprise" when these repeating natural disasters strike. To live in these areas is to live with the ever-present knowledge that such risks will never go away. My hope is that more and more of these people will take seriously the importance of personal preparedness so that more lives can be saved as these repeating disasters continue to unfold. If you really want to get Americans to take cover and seek shelter, tell them there's an armed teenager running loose in their city, tossing pressure cookers everywhere. The people will immediately and obediently follow orders and seek cover in their homes. But tell them there's a category 5 hurricane about to strike their city, and they'll ignore the warnings while calling a bunch of friends over for a "hurricane party." Making matters worse, local governments rarely invest in the construction of buildings that can serve as effective shelters against oncoming storms. Many of the children killed in Oklahoma yesterday, for example, were killed by collapsing roofs of schools. Television footage on Monday afternoon showed homes and buildings that had been reduced to rubble in Moore, which is south of Oklahoma City. Footage also showed vehicles littering roadways south and southwest of Oklahoma City. At the Plaza Towers Elementary School, students were hugging and clinging to the walls of the school as the tornado passed over, KFOR reports. An Associated Press photographer saw several children being pulled out of what was left of the school. The school's roof appeared mangled and the walls had fallen in or had collapsed. Dare I ask the question: Why didn't that school have a basement for sheltering the children? My message in all this? In every natural disaster, more people die than should have died. I'm not blaming everyone who died for their own death, because there's always that 20% "luck" factor when it comes to storm and disasters. Sometimes people are literally killed due to no fault of their own. Sometimes people who prepare still get caught by unexpected random events. But across the board, at least 80% of your "risk" in a natural disaster is under your own control. Is the TV news warning about an approaching tornado? Seek out an underground shelter and stay there until the storm passes. Is the National Weather Service warning about an approaching hurricane? Evacuate early and get out of the way of the storm. Worried about earthquakes? Carry emergency supplies in your car, in your basement and even simple items on your person (like a flashlight and seatbelt cutter). No matter what risks you face in your particular geographic area, there are smart, effective ways to drastically reduce your risk of being victimized by disasters. Nearly all "natural" disasters are repeating, predictable events that occur over and over again in the same geographic areas. People who build homes in flood plains should never be surprised when their homes flood. People who build homes in forests should never be surprised when those forests burn. People who live in Oklahoma should always be prepared for tornados. ... and most people simply won't do that. It takes too much effort to plan ahead. Was Oklahoma's recent record breaking earthquake caused by fracking?